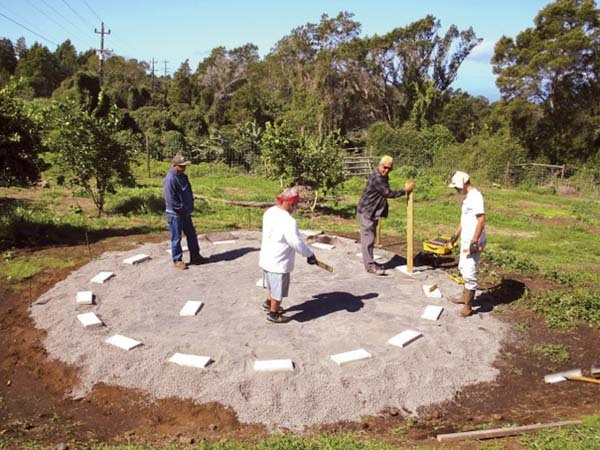 Hawaiian homesteaders ‘Aukai Hatchie (from left), Moki Takatani and Ka‘eo Ornellas build the first 10,000-gallon water catchment with construction leader Das Mullins to ensure that 20 cement bricks are aligned and level at Malalani garden in Keokea. The tank will serve Keokea Homestead Farm Lots Association’s community-agricultural projects. With high infrastructure costs and a shortage of water for Hawaiian homelands projects, Waiohuli homestead resident Kekoa Enomoto knew she needed to initiate a solution. Enomoto, chairwoman of the nonprofit Paupena Community Development Corp., proposed and is administering a $47,000 Department of Hawaiian Home Lands grant for six steel water-catchment systems for Waiohuli-Keokea Hawaiian homestead farmers. DHHL provided funding for the water storage tanks as well as professionals to teach homesteaders how to live off the land. 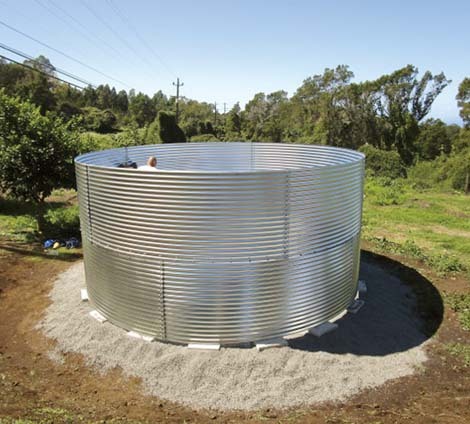 The six catchments have walls up, with one tank in Waiohuli and five in Keokea. The next step includes installing the top covers, painting the walls, and adding plumbing and aluminum gutter systems. All labor and material are included in the grant. Each tank holds 10,000 gallons of water for each recipient’s lot. Keokea homesteader and water catchment recipient Creighton Low inspects the interior of a 10,000-gallon tank at the Malalani garden. Work on the first tank began Feb. 27 next to the Malalani farmers market located at Mile Marker 17 on Ulupalakua Road. The DHHL grant is providing training sessions for grant recipients on how to build the first catchment system so they can construct the other five tanks by themselves. The entire project is estimated to be completed by April. Enomoto has been advocating and negotiating for water and land ownership for Hawaiian homesteaders since her own personal experience as a waitlisted homesteader. Now, with the help of eight other board members, she is determined to uphold Prince Jonah Kuhio Kalanianaole’s century-old dream of ensuring that Native Hawaiians have access to agricultural and pastoral land. The mission of Paupena Community Development Corp. is to provide beneficiaries with water resources, financial education, farming and sustainability training, and to “huli’au,” or transform, the community. Paupena was established Nov. 29, 2016, by Enomoto and her former neighbor and program president Norman Abihai. They collaborate and partner with Alexander & Baldwin, Lapaau Farm of Olinda, Hawaii Farmers Union United, James C. Sakugawa & Sons Ranch, Maui Farm Bureau and Maui Nui Botanical Gardens. This program also works closely with DHHL. The Maui County Department of Water Supply is providing water for homesteaders currently, but that source is expensive, said Enomoto. The six Waiohuli-Keokea farmers now will rely solely on rain for drinking water as well as water for farming. However, Kula is known for its cooler, dryer weather and occasional droughts. According to U.S. climate data, Kula gets an average of 23.27 inches of rain a year. Enomoto hopes that the 10,000-gallon catchments will store enough water for homesteaders to make it through any drought periods. This water catchment project is a test case for DHHL as it moves forward with plans for 1,200 agricultural-residential 1-acre lots in the area. The first six catchments systems in Waiohuli-Keokea will allow DHHL to decide whether this is a viable water source for future needs on these 1-acre lots, Enomoto said. On DHHL’s list of Maui applicants waiting for a homestead are around 4,600 agricultural, 600 pastoral and 3,700 residential applicants. 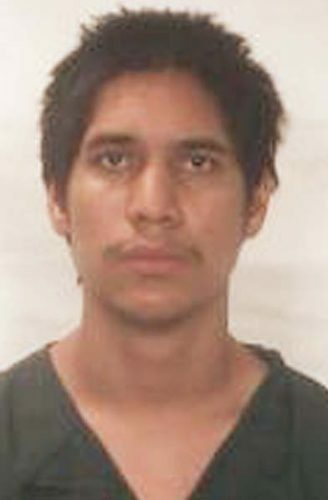 There are applicants who have been on the waiting list since the 1980s. Water can be an obstacle for DHHL efforts to develop homesteads. Enomoto and others in the Hawaiian homestead community said that implementing the six water catchments is a small step in the right direction.